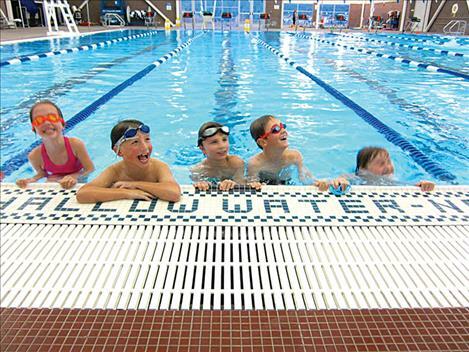 courtesy photo The GPCF allocated funding on an annual basis for the “sponsorship” program – which provided financial assistance for swim lessons and swim passes for those families, individuals and youth who were unable to afford it. 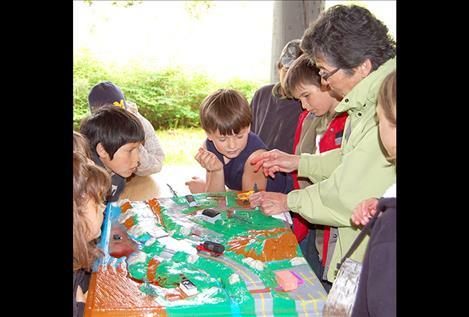 Flathead Lakers volunteer Libby Smith demonstrates and discusses nonpoint source pollution to students.The enviroscape model provided a powerful visual demonstration of how water and pollution flow through a watershed. 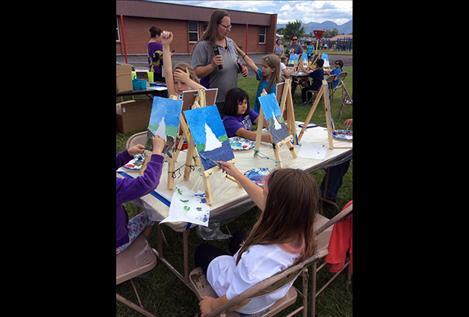 The GPCF supports a summer projects in Polson. POLSON — Last week, Penny Jarecki related how the Greater Polson Community Foundation came to be. It all started by reading a story about a Bigfork couple who donated to create the Bigfork Community Foundation Trust. “I got the idea, but it wasn’t original,” she said, relating the story she read in the Daily Inter Lake in 2007 about how the estate of the late Ed and Pat Box was used to start the Bigfork Community Foundation Trust. She said that the Boxes didn’t have children and neither do the Jareckis, so their situations were similar. Jarecki, a Big Sandy native, and her husband Chuck, an Erie, Pennsylvania native, owned and operated a beef cattle ranch in the Irvine Flats area before selling it in 1990 and retiring. They along with retired accountant John Cowan and several others started the Greater Polson Community Foundation with a meeting on Dec. 15, 2007. By the end of 2008, the group had raised about $50,000, she said. Ten years after the initial meeting, the Foundation now has an endowment of $650,000. The interest from those funds, along with other funds raised throughout the year, aid various community projects through direct funding and challenge grants. Among the things the Foundation has assisted over the years include: a $28,000 challenge grant to the Polson Youth Soccer Association to enable it to complete the Polson Soccer Complex in the Ridgewater development; $30,000 to fund three “Welcome to Polson” signs; $15,000 to the Flathead Lake International Cinemafest; $15,000 for interpretive signs at the interpretive trail at Sacajawea Park; and a multitude of smaller annual grants, primarily for youth projects. The Foundation issued grants in 2017 that totaled $26,100. Jarecki said the Foundation has raised awareness about philanthropy and the opportunities to give back to the community. The Foundation has “made people aware of how working together we can improve the community,” she said. Jarecki, who is president emeritus of the Foundation and a member of a 15-person governing board, notes that the non-profit has a mailing list of about 400 businesses and individuals. Toni Young just finished serving her first year as the Foundation’s president. She previously served as vice president for four years and secretary for two. Young said she is deeply honored to be a part of the Foundation and notes that it has grown exponentially through the years. “I think we will have even more tremendous growth over the next 10 years,” she said. The Foundation has received initial and continuing support from the Montana Community Foundation, which supports and manages funds for 74 similar non-profit organizations throughout the state, Jarecki said. She notes that the Foundation finally hired a part-time staffer, Jennifer Rolfsness, in 2015. The Foundation holds one “big event” each year: Passion for Polson, a type of celebration dinner party, fundraiser and “friendraiser” each August. For more information, call 406-883-4723 or go online at greaterpolsoncommunityfoundation.com.